I often get asked by my clients and at workshops how to encourage healthy after-school snacking. It’s an ongoing challenge for many families. Children arrive home from school absolutely famished and because we’re so busy, we don’t always have something fresh on hand… meaning that convenience food often enters into the snacking equation. Packaged convenience snacks usually contain little nutritional value, are low in fiber, high in sugar and unfortunately loaded with hidden nasties too. It’s the food in our homes that we have the most influence and control over – so ensuring our fridge and pantry options are as nutritionally sound as possible goes a long way towards healthy after-school snacking. Implementing a few simple swaps, some basic planning and slight reorganization of your pantry could significantly boost your children’s and family’s overall nutrition. This is more achievable than many busy parents realize. I hope that my practical tips, simple strategies and easy nutritious recipe inspirations will make this far more achievable for busy time-poor families. As with everything relating to ‘family nutrition’, my best advice is to embrace change gradually and to celebrate every positive step. Consistency and perseverance are the keys to success. I generally encourage pantry snacks to be paired with something fresh from the fridge – in the form of fresh vegetables, nutritious dips, fruit, spreads or a source of protein. 1. Learn to read and understand product labels: One of the first things I cover with my clients is how to read the product labels. Our pantries are often filled with items containing high sugar and salt content, and full of preservatives and additives that are cleverly disguised under long and confusing names. I also advise my clients to resist the temptation to stock ‘single serve’ packaged snacks. These too often come loaded with hidden nasties, they’re also less environmentally friendly and teach our children to always expect snacks to arrive in bright and sparkly packaging – leaving natural and whole food options looking and seeming dull in comparison. A basic understanding of how to read and understand the ingredient labels on food packaging is essential in arming ourselves with the purchasing power and nutritional knowledge needed when at the grocery store or shopping online. This is a topic which I cover in great detail in my book The Wholesome Child: A Nutritional Guide with More than 140 Family-Friendly Recipes. 2. Simple family favorite swaps: Swapping out high sugar spreads with nutritious homemade options (see my Healthy Chocolate Spread), or substituting commercial tomato ketchup for easy and simple homemade options that are lower in sodium and sugar are examples of small changes that make great headway on our journey towards better family nutrition. See our Homemade Ketchup recipe for a nutritious and tasty alternative to store-bought tomato sauces. Replacing processed white bread and crackers with high-quality whole grain or sourdough options also makes a considerable difference to a household’s overall nutritional intake. Eating good quality bread is, in fact, one of the most beneficial and valuable changes that can be made to improve your families nutritional health, and in the first chapter of my book – Swapping to Whole Grains – I go into great depth explaining this. Other gradual changes that are simple, yet extremely effective, are swapping out milk chocolate for dark chocolate, or substituting standard candy with natural and preservative-free options. 3. Repositioning items: Assess which are the first items your child sees when opening the pantry. Generally, what the eye sees the tummy wants (just like most adults!) – so a simple and helpful strategy could be to move the less nutritious options to higher shelves, or pack them away in sealed plastic containers. Keeping healthier snacks at lower, more accessible levels can do wonders for improving snack choices. Keeping cans of tuna, beans and bottles of passata are incredibly helpful in making ‘last minute’ meals in the event you are caught short. Tip: to reduce the sodium content in canned beans, always rinse thoroughly in a sieve under cold running water. Having herbs and spices on offer (rather than just salt) helps add variety and flavor to snacks. Popcorn – simple, quick and easily made at home, plus it stores well in an airtight container. Popping your own also means that you have more control over the amount of salt used. Whole grain pasta, bread and crackers – the Flaxseed Crackers recipe on pg. 185 in my book is gluten-free, nut-free and vegan-friendly, packed with healthy fats and fiber, and can last in an airtight container for up to 14 days. These scrumptious crackers are ideal to be paired with fresh contents from the fridge. Muesli bars – are an excellent nutritious option that are easy and inexpensive to make at home. 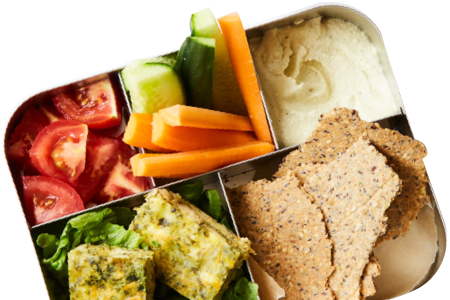 These can be stored in an airtight container for after-school snacks as well as lunchboxes. See my recipe for Apricot and Coconut Muesli Bars. Homemade trail mix – my children love getting involved in making this. I recommend using a selection of unsalted nuts and seeds (like flaxseeds, pumpkin seeds, sunflower seeds and chia seeds) including a handful of raisins or goji berries, puffed quinoa, shredded coconut and even some lightly salted popcorn. It keeps for weeks in an airtight container. Homemade cereals and granola – in my book I feature a Quick Homemade Granola recipe (wheat and nut free), as well as a healthy recipe for Chocolate Rice Puffs (gluten and nut-free). These are ideal nutritious swaps for children who love their chocolate cereal snacks when coming home from school. Dried fruit – even if you don’t have a dehydrator, you can simply and easily slow-cook fruit in the oven to achieve the same effect. Thin slices of apple take around 2 hours to transform into crisp, sweet fruit chips that are free from some of the preservatives and additives commonly found in commercial options. Healthy biscuits and cookies – I’m definitely an advocate of balance. As long as they’re portion controlled, keeping a stash of nutritious sweet snacks is very important! Some of my favorites include Healthy Gingerbread Men, High Protein Peanut Butter Biscuits and Almond and Buckwheat Vanilla Biscuits. 5. Get the family involved:Getting your children interested and involved in meal and snack planning, shopping and preparation can be very helpful to teach our kids an appreciation for fresh, healthy produce and ingredients that go well together. Use a meal planner to get your family’s input as to what snacks and meals they’d enjoy, and create a shopping list around this. Don’t be afraid to shop online and get it delivered either! This is a great time-saving convenience for busy families and an effective way of making sure that you aren’t caught short on nutritious supplies. The last section of my book features an array of helpful menu planners. I’m also a big advocate of bulk cooking and freezing (both meals and snacks) in preparation for those crazy weeks we all have. Getting the children involved in the food preparation and cooking helps create a positive association with nutritious food, and also teaches them basic principles to make them more independent in the kitchen. This is vital in giving our kids the confidence and ability to create their own healthy snacks with fresh ingredients – and helps address the constant demand for processed convenience options. As much as possible, I recommend directing your child to the fridge to find an accompaniment to their pantry snack. For the after-school sandwich, you could suggest cheese and tomato, some homemade hummus, ricotta spread, tzatziki, avocado to mash into a spread with lemon, or even some leftover shredded chicken. Keeping an array of fresh vegetable sticks in the fridge, or some cherry tomatoes and baby cucumbers also makes further quick snacking options easily available. Many parents report being pleasantly surprized by what their hungry children will choose to eat when healthy options are in the fridge prepared and waiting. I also recommend keeping cut up pieces of fruit in sealed containers. 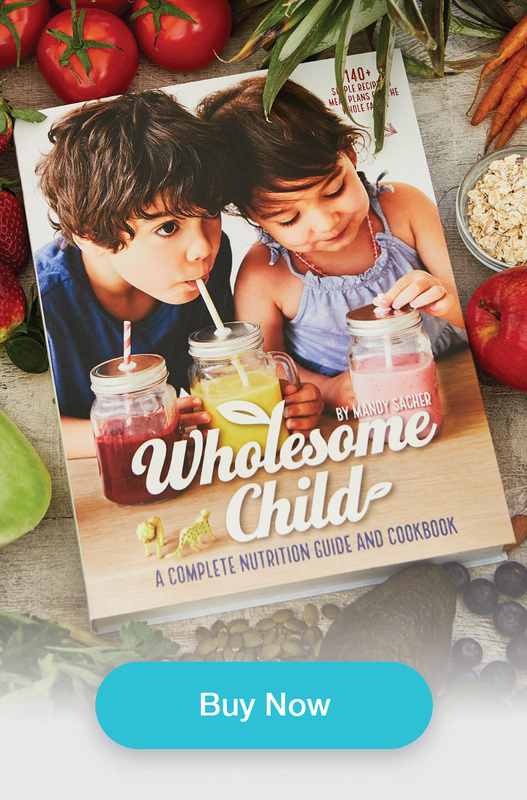 In my book, The Wholesome Child: A Nutritional Guide with More than 140 Family-Friendly Recipes, I provide over 140 allergy-friendly family recipes and nutritious snack ideas – many of which can be made in advance and kept in the freezer for nutritious after-school snacks and for lunchboxes too.